If you ask Siri for a definition, she will say:"I will look up 'sere, seared or Sears ' for you".....leaving you to wonder why your asking intimate questions of a "person" you have never met. But what you want is to understand that a "Series" is any number of things that are arranged to happen sequentially and is a set of similar objects that involve the same characters, setting or subject matter." ......................................................Why not give painting a series a try? As artists, it is our job to learn how to see and understand design composition,mood, creativity and color. One of my favorite ways throughout the years to improve my craft & artistic knowledge has been to paint an image several times. Are you wondering if painting a series gets boring? No, I , like many artists before me, look to create variables with each work in a group of paintings. Today let me introduce you to another artist, who also painted in series and happens to be one of my favorites. 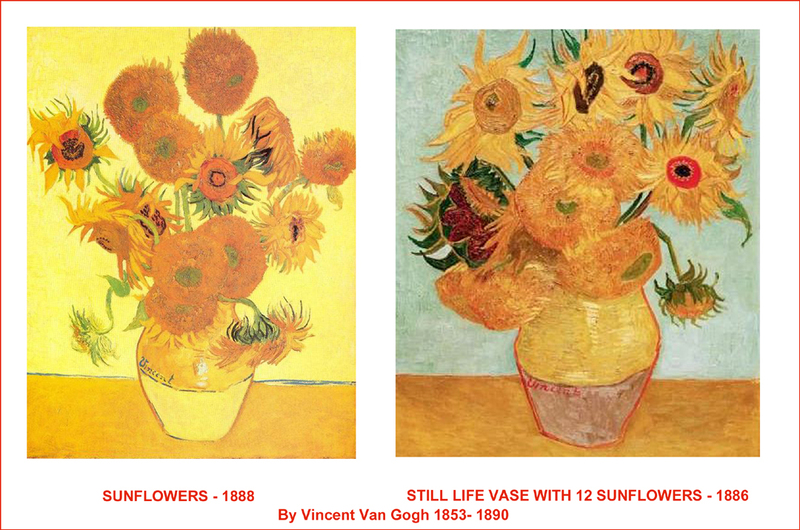 Above are two examples of painting in series by the great Vincent Van Gogh. Do these paintings by Van Gogh inspire you as they do me? Why? Is it because there is such stunning beauty in looking at a simple object like a vase of flowers. Do you recall the haystack paintings of Claude Monet shown in my last blog? Now lets look at the haystacks one more time. 11 paintings all of the same object each one painted at a different time of day, season or from a uniquely different perspective. or painted your landscape in the evening. You could also have your flowers on a table surrounded by warm colors, like the bright yellows in Van Gogh's "Sunflowers". What if your flowers were on a table next to a wall that was painted with cool colors? How about asking yourself WHAT IF I.... change my painting from a vertical format to a horizontal ? How will your painting look differently then? 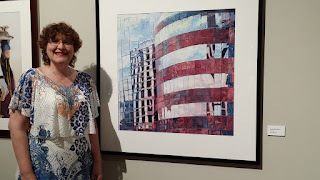 Painting a series gives an artist an opportunity to repeatedly be inspired, while learning to appreciate the nuances of change created by studying the variables of our inspiration from different perspectives. I have my favorite subjects that I enjoy painting repeatedly. Following I would like to share some of my paintings that are now part of a personal series about my love of gardens. It all started in 1997 when I went to Selby Gardens in Sarasota Florida. 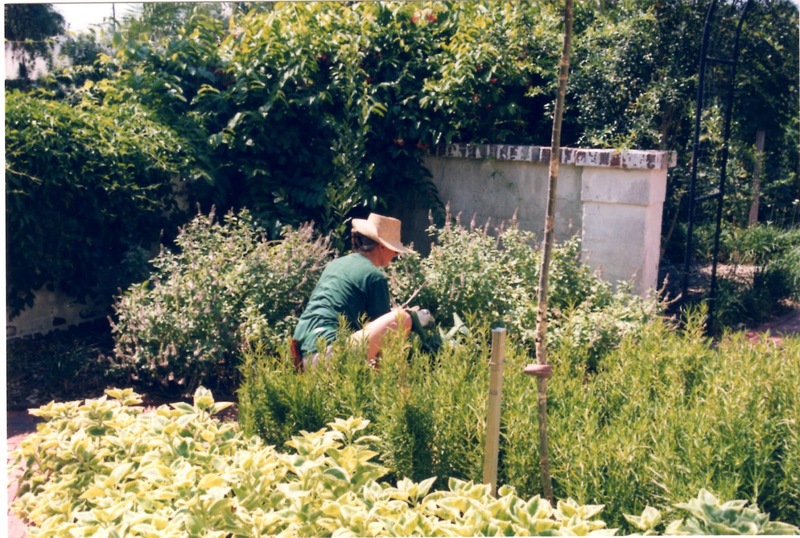 Walking around the gardens I spotted this woman diligently working in the sunshine. She has become the protagonist of several of my paintings, now. The first time I created a work inspired by my visits to Selby Gardens, I was working with pouring transparent watercolors exclusively. I used only "Pthalo blue, hansa yellow and alizarin crimson". In 1998 I asked myself WHAT IF I....? In this next work I made different color choices in order to create a variable. 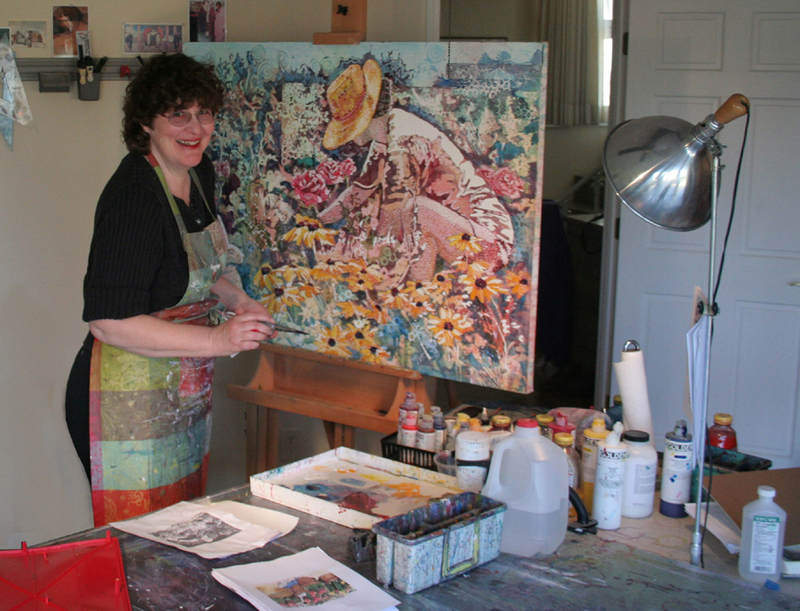 In the new painting I chose to "push" my color palette by also pouring with "new gamboge yellow" on the paper. I also turned my horizontal painting into a bold and colorful vertical image. 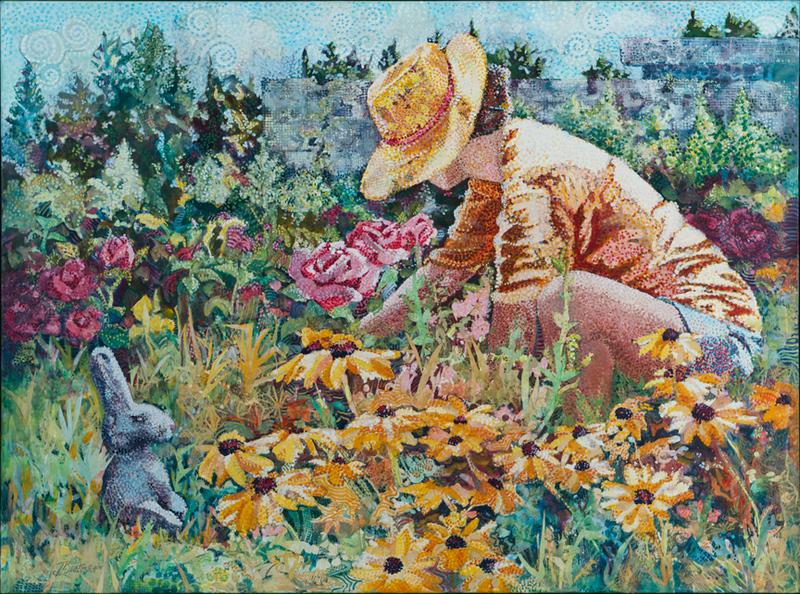 "HER GARDEN GROWS" 30 X 22" poured transparent watercolors on paper. My Selby Garden series doesn't end yet. There is one more painting that is a part of this series. This time I decided to really "go to town" and be truly FEARLESS in my approach to painting my lady friend. "JUNGLE MANAGEMENT" was created in 2011. This painting is 36" x 48" . It was made with pouring my watercolors, painting with acrylics and working with collage using the small bits and pieces of paper that I had used in my original pouring technique. 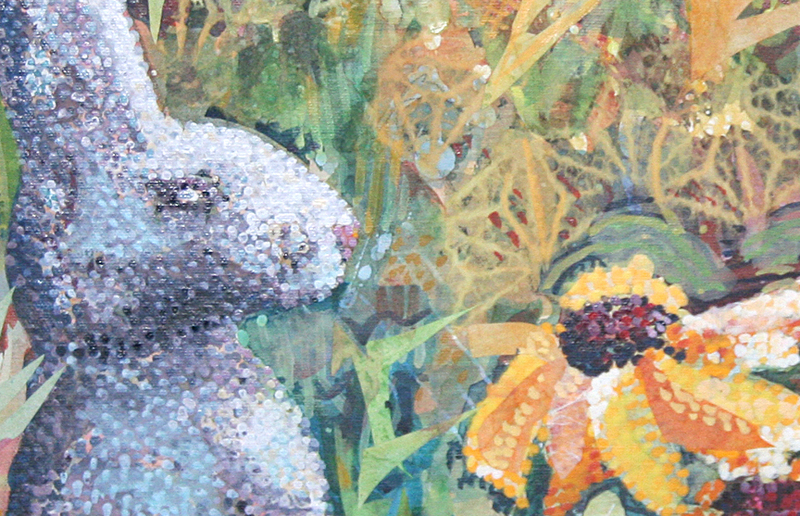 Below is a close-up photo of the lower part of my mixed media painting on canvas. You can see the delicate colorful papers that have been torn and adhered to the canvas to create an illusion of grass and flower petals. I love working with collage! I guess, my final question for you now is: What will you paint next? and let's talk about art! 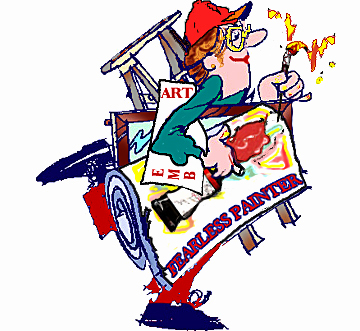 My art classes are designed to help you become a fearless artist! 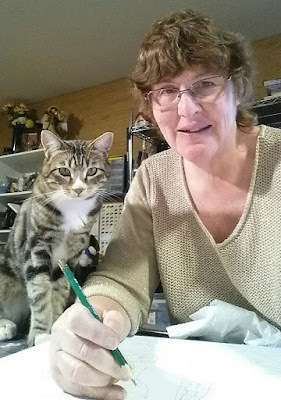 Thank you for visiting me here at my art blog. Come back regularly as I am always posting something new to inspire you.